A classmate and I were mulling over pendulums on the train ride last night and couldn’t come to any conclusion. We were discussing how mass as a variable effects two pendulums. Initially, my response was that a more massive pendulum would rise to a higher point once released (if two pendulums of differing masses were released from the same height) because it has greater PE, but then we got confused because it also takes more energy to keep it swinging. 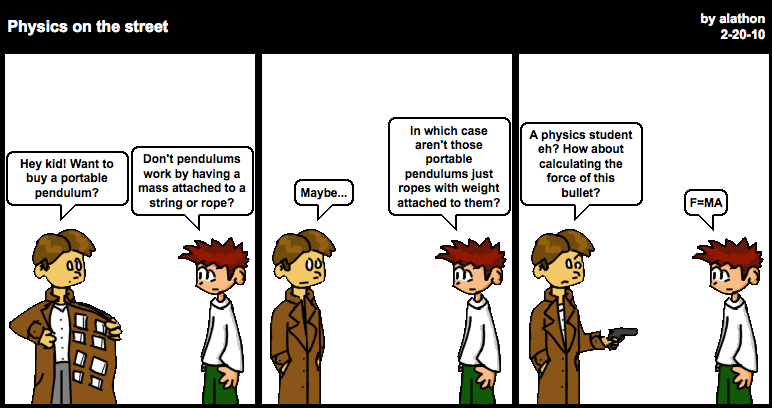 So then it also made sense for both pendulums to reach the same height and have the same period with every oscillation. Since we couldn’t come to any conclusion, I went home and played around with some homemade pendulums. I constructed one with some gift wrapping ribbon and one fork and another with gift ribbon and five forks. Attached is a slide show and commentary of what I found. I pretty much observed both phenomena of the two forks at same heights with same periods as well as two forks with same periods but different heights. Then I coupled the two pendulums just for kicks. My husband Keith got home from work as I was curled up nearly under the sink in the bathroom trying to take pictures. Oh, Physics!